In The New American Empire, leading authorities on U.S. foreign policy examine the historical underpinnings of the new American unilateralism. Offering an accessible, critical overview of U.S. policy in Asia, Europe, Latin America, and the Middle East, they assess both the distinct continuities between past and present U.S. policy, as well as what makes the current administration’s policies dramatically different. The essays also reveal how those policies serve the ends of favored groups for whom imperialism pays both ideologically and materially. 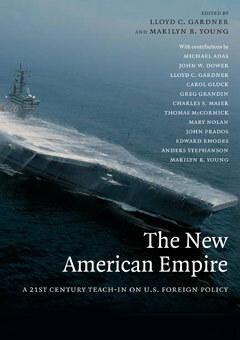 Both an essential historical primer on America’s new imperial role and a thorough dissection of the Bush administration’s foreign policy objectives, The New American Empire is sure to become a touchstone for understanding America’s role in the twenty-first-century world. Contributors include: Michael Adas, John Dower, Lloyd Gardner, Carole Gluck, Gregory Grandin, Thomas McCormick, Mary Nolan, John Prados, Edward Rhodes, and Marilyn Young.